James Padilla was raised in poverty and abuse, living in foster care by age 13, on the streets by 16 and was in jail by 19. 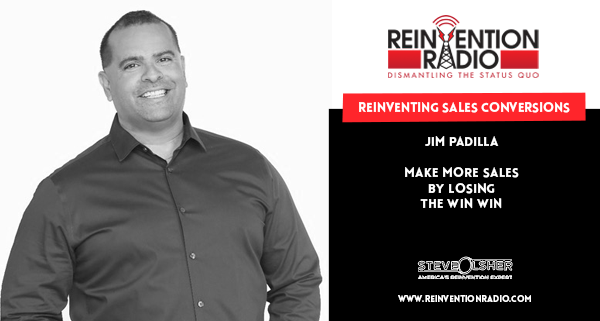 After spending decades running away from loss and poverty, Jim finally figured out how to share the skills he’d gained, teaching people how to master sales and leadership by influencing their environment to get people to trust them and want to buy from them. Today, Jim is a Master Sales Trainer, an Expert Team Builder and a Launch Expert. With more than 20 years of experience in building teams and leading them to success, Jim has a solid track record of achieving results. Jim and his team lead entrepreneurs to huge success in their launches, driving sales and surpassing their goals and expectations. Having shared the stage with Jay Abraham and Les Brown, Jim brings an exceptional level of experience and talent to the world of sales. He inspires his team and partners to achieve their full potential and is now running a multi-million dollar business serving leaders powerfully. Jim is also passionate about helping people to use sales skills as an engine for social change, such as reducing recidivism rates among ex-cons, by giving them a vision a purpose and a path, moving us from carrying the heavy expense of warehousing them to ex-cons becoming contributors and difference makers in society. Tune in to hear Jim chat with Steve, Mary, and Richard about his journey from loss, poverty, and crime to where is today. What was happening in your life to make you act on that email? Reinventing Immigration – In this episode, tune in to hear Rick Sterger chat with Steve, Mary, and Richard about his journey, immigration law and the impact on children and families.